The global digital therapeutics market is expected to reach USD 457.9 Million by 2021 from USD 110 Million in 2016, growing at a CAGR of 27.7% from 2016 to 2021. The factors driving market growth include growing incidence of chronic diseases, rising focus on preventive healthcare, technological advancements, growing need to control healthcare costs, significant increase in venture capital investments, and the benefits of digital therapeutics. However, factors such as lack of awareness and access to digital therapeutics programs in developing countries, patient data privacy concerns, and resistance from traditional healthcare providers may restrain the digital therapeutics market growth. North America dominates the digital therapeutics market, with the U.S. accounting for the major share and highest CAGR. This can be attributed to the growing incidence of chronic diseases, government initiatives to support technological advancements in digital therapeutics, gradually improving reimbursement structure for digital therapeutics solutions, and a growing influx of new startup companies in the market as a result of increasing investments in the digital therapeutics field. For instance, in July 2014, Proteus Digital Health (U.S.) secured an investment of USD 172 million from a list of institutional investors for the manufacturing and development of its digital medicine products. Furthermore, in January 2014, WellDoc, Inc. (U.S.) received USD 20 million from the Merck Global Health Innovation Fund (U.S.), which it used to commercialize its products in the U.S. Such investments are likely to spur the growth of the market in North America in the coming years. The prominent players in the digital therapeutics market are Proteus Digital Health, Inc. (U.S.), Omada Health Inc. (U.S.), WellDoc Inc. (U.S.), Livongo Health (U.S.), Noom Inc. (U.S.), Ginger.io Inc. (U.S.), Propeller Health (U.S.), 2Morrow Inc. (U.S.), Canary Health Inc. (U.S.), and Mango Health, Inc. (U.S.). Company profiles for five additional companies. The global digital therapeutics market is projected to reach USD 457.9 million by 2021 from USD 134.8 million in 2016, at a CAGR of 27.7% from 2016 to 2021. The growth in this market is majorly driven by government initiatives to increase focus on preventive healthcare, technological advancements in mobile healthcare, significant increase in venture capital investments, and benefits offered by digital therapeutics such as the ability to induce behavioral change (an important challenge in healthcare), user-friendliness and patient convenience, and improved drug compliance. On the other hand, lack of awareness and access to digital therapeutics programs in developing countries, patient data privacy concerns, and resistance from traditional healthcare providers are the major factors limiting the growth of the market to a certain extent. Based on sales channel, the digital therapeutics market is segmented into business to customer (B2C) and business to business (B2B). In 2016, the B2B segment is estimated to account for the largest share along with the highest CAGR of the digital therapeutics market. There is a growing awareness among providers, payers, and employers about the benefits provided by digital therapeutics, and the amount of healthcare cost reductions achieved by their use. Additionally, there is a growing inclination of pharmaceutical companies to integrate digital therapeutics with their drug product to offer adherence services along with their product. These are some of the factors responsible for the high share of this market segment. Based on the type of buyer, the B2C sales channel market is further segmented into patients and caregivers. The caregivers segment is expected to dominate the market, and register the highest CAGR during the forecast period. The high growth of this segment is attributed to company initiatives for the development of products specifically for caregivers and the fact that digital therapeutics help caregivers in better management of patients. Geographically, the digital therapeutics market is segmented into North America, Europe, Asia-Pacific and the Rest of the World (RoW). In 2016, the North America is expected to dominate the market, followed by Europe. The market in North America is expected to grow at the highest CAGR during the forecast period. Factors such as the influx of new startups owing to increasing investments in the digital therapeutics field, gradually improving reimbursement structure for digital therapeutics solutions, and government initiatives to support technological developments and advancements in the field of digital therapeutics with a view to curb growing healthcare costs are driving the growth of digital therapeutics market in this region. 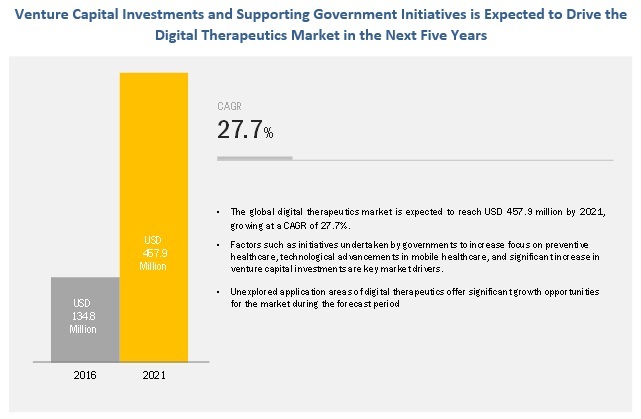 However, stringent regulatory approval processes and unstable regulatory framework may restrict the growth of digital therapeutics market. Key players in the digital therapeutics market include Proteus Digital Health, Inc. (U.S.), Omada Health Inc. (U.S.), WellDoc Inc. (U.S.), Livongo Health (U.S.), Noom Inc. (U.S.), Ginger.io Inc. (U.S.), Propeller Health (U.S.), 2Morrow Inc. (U.S.), Canary Health Inc. (U.S.), Mango Health, Inc. (U.S.), and Physitrack Limited (U.K.). Click Therapeutics, Inc. (U.S.), Pear Therapeutics, Inc., (U.S.), Akili Interactive Labs, Inc. (U.S.) and Wellthy Therapeutics Pvt. Ltd (India) are some of the emerging players in this market. In Febuary 2016, Omada Health, Inc. launched a new version of its diabetes prevention program, Prevent. The new product includes additional features designed to meet the needs of underserved populations. This launch enabled the company to improve its product offerings and expand its customer base. In March 2016, WellDoc, Inc. entered into a strategic collaboration with LifeScan, Inc. (U.S .), a Johnson & Johnson (U.S.) company, to provide digital therapeutic solutions for patients with type 2 diabetes. As per this collaboration, WellDoc’s product Bluestar will be integrated with LifeScan’s products OneTouchVerio Fle Bluetooth Smart blood glucose monitoring system and OneTouch Revealmobile app. This collaboration enabled WellDoc to access Johnson and Johnson’s large patient base. In April 2016, Proteus Digital Health, Inc. received a Series H financing worth USD 50 million. This enabled the company to expand its Digital Medicines platform. Which are the recent contracts, partnership and agreements key players have signed? 11.2 Proteus Digital Health, Inc.